The Pink Roadhouse is 200 km north east of Coober Pedy on the famous Oodnadatta Track in the north of South Australia. We provide fuel and vehicle supplies, tyres and do vehicle repairs and recovery. We have hot food, sit-down meals, take away, hot and cold drinks and friendly staff. We supply groceries and fruit and vegetable frozen meats various household and camping supplies and a range of country clothing. 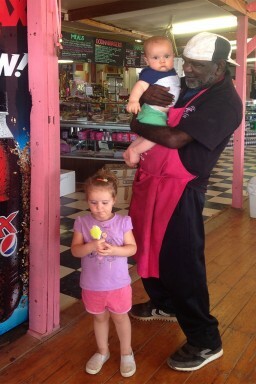 The Pink Roadhouse has an history as interesting as Oodnadatta itself! And don't forget the famous OODNABURGER!! !